Here is a list of the extra places being offered by the bookmakers on 20th April. In the world of matched betting extra places can be a very lucrative tool to have at our disposal. 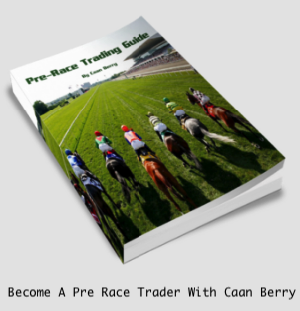 Put simply you can make money by placing Each Way bets at a Bookmaker who is paying more places than the equivalent market on the Betting Exchange. This difference means you can make a profit if your horse finishes 5th, as the bookie will pay out on the first 5 places plus your exchange lay bet will also win as your selection was outside the first 4. 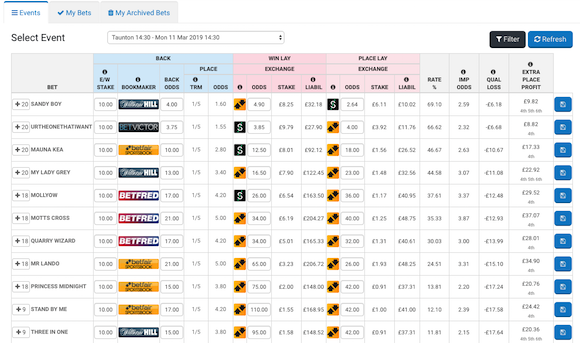 Even better some bookmaker offers will give you 2 or even more extra places on certain races at certain meetings thereby increasing your chances of hitting a ‘win-win’ scenario on both sides of the matched bet. And it gets even better than that, as our matched betting partner OddsMonkey have a fantastic software tool, EXTRA PLACE MATCHER, that scans all the odds and flags up any profitable opportunities. For the time it saves and low hanging fruit it collects, it really is a no brainer. The 2019 Grand National takes place on Saturday 6th April (5.15pm) at Aintree and plenty of bookmakers are offering extra each-way places on the big race. It’s the last day of The Festival. Boo…. But it’s Gold Cup day! Ya Ya! Here’s everything you need to go out of the 2019 Festival with a bang. And if it is Extra Places in all the races you are after then we have those all covered to right here too. Literally gifts everywhere you look, no wonder it is called Cheltmas. Right then enough of this waffle, show me the money! Yep, 2 down 2 to go and the offers just keep on coming. Your bible for Day Three of the 2019 Festival all here on one page. The Cheltenham Festival, The Greatest Show On Turf, gets underway with the Supreme Novices’ Hurdle at 1:30pm on Tuesday 12th March. That famous Cheltenham roar as the tape goes up signals the start of the four days of top class action with a total of 13 Grade One races cumulating with the Gold Cup on Friday the 15th. And while the action on the course is red hot, when it comes to offers, the bookmakers never disappoint over the Festival too. Enhanced odds & price boosts, free bets & refunds best odds guaranteed, extra places & non runner money back to name but a few, Cheltenham week is hard to beat. Naturally we are right across everything here at Bet72 to provide you with everything you need for your most profitable 4 days of the year. BETFRED Back a horse in the 13:30 everyday at Cheltenham, and should it finish 2nd or 3rd, we will refund your stake as a Free Bet up to £10! TOTESPORT Back a horse in the 13:30 everyday at Cheltenham, and should it finish 2nd or 3rd, we will refund your stake as a Free Bet up to £10! And of course if you have any questions or queries about the best way to play out any of the offers you see then please just drop us a line to info@bet72.com and we will be happy to help. Right let’s saddle up & make some profits! Wow, what an opening day that was! And the good news is we can do it all over again today too. All the offers you need for Day Two of the 2019 Festival all here on one page. How do you fancy a 100% profit boost from one of the most innovative online bookmakers out there? You do, well read on…. Get stuck into the action with the LeoVegas SPORT Welcome Bonus – a 100% Profit Boost of up to £100 Extra Winnings when you make your first bet at LeoVegas SPORT. Simply deposit a minimum of £10 and you will automatically find your 100% Profit Boosts waiting! Step 5: Sit back, enjoy the game and win up to £100 Extra! Deposits made via Skrill or Neteller are not eligible for the two 100% Profit Boosts. 1. All new registering sports customers from the United Kingdom and Ireland aged 18 years+ who create an account with LeoVegas starting from 03/10/2018 onwards will be eligible for a New Player Sports Bonus. 2. The New Player Sports Bonus is one (1) 100% Profit Boost to use in-play. 3. To be eligible for 100% Profit Boost customers must deposit a minimum of £10. 4. The 100% Profit Boost is valid for 30 days after you have signed up. 5. The profit boost must be used in-play. 6. The maximum stake for the 100% Profit Boost is £10. 7. The bet placed to claim the profit boost must be placed in one instance. 8. Each way and system bets will not be eligible. 9. The bet can be placed on mobile only. 10. The maximum extra winnings are capped at £100. 11. Deposits made via Skrill or Neteller are not eligible for the New Player Sports Bonus. 12. The Profit boost is available to use on mobile only. 14. A maximum of one New Player Profit Boost per person/ account/ household or IP address is allowed. 15. Bets made void do not qualify for your first bet. If your first bet is a non-runner and/or void, you will not be eligible for the offer. 16. Cashed In bets do not qualify. 17. Extra Profit Boost winnings will be paid as cash. 18. It is the customer’s responsibility to be opted in to receive communication from LeoVegas. 19. This promotion cannot be used in conjunction with any other offer. 20. LeoVegas retains the right to change or withdraw the promotion at any time. 21. LeoVegas reserves the right to withdraw and/or change the promotional terms and conditions/material relating at our sole discretion, and any decision with regards to the winnings offered. 22. LeoVegas may, at its sole discretion, exclude any customer from receiving selected promotions (e.g. guaranteed best price; bonuses; free bets; enhanced prices; and money-back specials) and any other promotions and offers. 23. Winners must be 18 years or older and only have one membership account open with LeoVegas, as per the general terms and conditions found on site. 24. Should LeoVegas discover a player with multiple accounts qualifying bets and therefore winnings will become null and void. 25. LeoVegas reserves the right to exclude, cancel or remove Free Bets and Free Bet winnings from accounts that have been deemed to be fraudulent. 26. General LeoVegas T&Cs apply. 27. The decision of LeoVegas management is final. It’s the New England Patriots v Los Angeles Rams in Super Bowl 53 that’s LIII in old money, on 3rd February at the Mercedes-Benz Stadium in Atlanta, Georgia. Looking forward to this one, especially with so many offers available! Here are our pick of the best current ones available so far from our leading bookmaker partners & as we find them we will keep adding them too, so keep checking back & you won’t miss a thing ahead of the big game. PADDYPOWER 03/02/19 14 Up You Win - Your bet will be paid out in full if your team is winning by 14 points at any stage in the match regardless if your selection goes on to draw or lose the game. Applies to pre-match single bets in the Match Betting market only. Offer does not apply to bets placed on the Draw selection in each game. Applies to all televised NFL games on Sky Sports & BBC from Thursday 06/09/18 to Sunday 03/02/19 inclusive.